Join us for a fun filled evening. 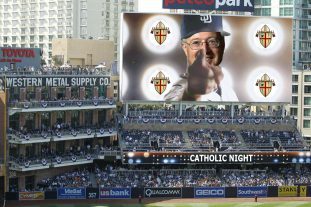 Bus will depart OMC at approximately 4 PM so that we can beat the traffic and enjoy a leisurely visit at Petco park before the game that begins at 7:10 PM. There are many options for food and beverages. We will plan on returning to OMC no later than 11 PM unless we decide to stay for the fireworks. Wear a White Jersey, Hoodie, T-shirt or Jacket to show our unity. A fun evening with fellow parishioners….. priceless!